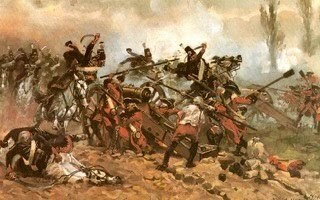 The build up described in the last couple of posts came to a head on Saturday with the refight of the Battle of Neerwinden in 1793. Steve, John the Red, Conrad and Paul took part, with the former two playing the French and Conrad and Paul the Austrians. On the French side Steve was Dumouriez while John was General Egalite-fils (the Duc de Chartres and future King Louis Phillips of France). Paul was Colloredo on the Austrian left and Conrad was Archduke Charles. I don’t recall who was Saxe-Coburg-Saalfeld the Austrian CinC but his figure spent most of his time supporting Paul. Turn 1and John clearly has a cunning plan as the Austrians make their move, shuffling their line forward a bit. 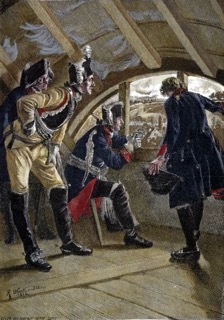 The Austrian plan had been to push their right forward to block any French entering the table over the northernmost bridge, but the troops failed to move. Steve (Dumouriez/Valence) forms his division up while John (Egalite) brings his division on over the bridge seen in the background. The Austrian left looks to be in a very strong position. However, the skirmish bases did not represent useable troops, but just a thin screen of stragglers from light troops originally posted along the riverbank. Once the French got within 18" the bases were removed from play. On the next turn Steve ordered an attack and got three moves, hitting the Austrian line with what looked like overwhelming force. Sadly, the French were all volunteers and levee and were therefore at a bit of a disadvantage. Nevertheless they weathered the storm and hit the Austrian line and forced it to retreat in disorder. The victorious French had taken a bit of a hammering, and were to take more from the Austrian artillery. Meanwhile John attacked Neerwinden, which was held by a unit of Grenz, many of whom were clearly drunk if the photo is anything to by. This state of inebriation clearly fortified the defenders as it took several turns for them to be ejected even after the attackers had forced their way into the town. Miranda's troops pouring (slowly) across the two northernmost bridges. The French under Egalite-fils (John) deployed in the relative safety of the dead ground behind Neerwinden. Steve's artillery were having a bad day. Steve was too as he threw 10's and 11's for his command roll on four successive turns (including the re-roll given by having the CinC with him) so the entire attack ground to a halt. The infantry traded shots with the Austrians but the latter's artillery was causing casualties (and disorders) on the largely stationary French. French crossing the river at Wangen in the centre of the table. Miranda's most northerly brigade crossing the river, led by a battalion of volunteers in column of mob (a new formation introduced for the FRW) and a battalion of regulars. Steve's flank was still stuck and his heavy batter, unable to move, had taken casualties of the Austrian batteries. The Austrian right finally began to lumber forward to try and keep the French from deploying off the bridges. The volunteers screening the regulars were forced to retreat. John then managed to throw double 6 , then another 6, so the regulars formed into assault column once of the bridge and charged the Austrians who promptly evaded. 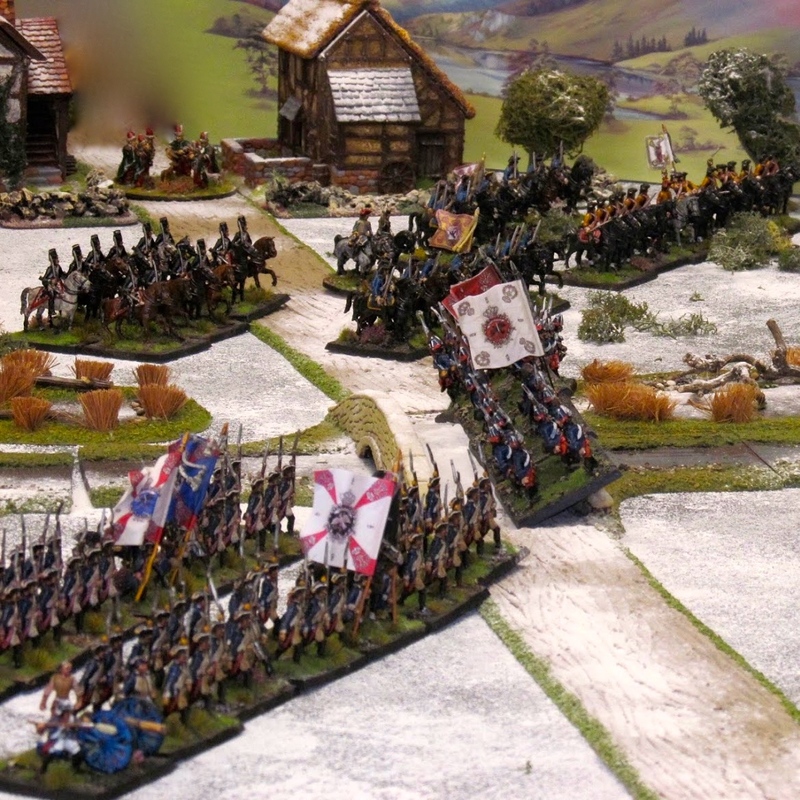 The blunder was shame as two regiments of Austrian uhlans suddenly had a flank to charge. It being a flank attack the French were unable to form square. They held on and didn't break but did have to fall back, followed up by the uhlans. Another view of the Austrians hitting the French in the flank. The battlefield just before we broke for lunch. The Austrian right wing stopped their advance and made sure they were in nice neat lines. Meanwhile the uhlans made short work of the retreating French regulars and broke them. The uhlans then withdrew .to the safety of their own troops. The French in the centre were being held back and prevented from deploying, frustrating any attempt to take the fight to the Austrians and to break out from the bridgehead. Paul sent two battalions forward around the north side of Neerwinden, screaned by a herd of sheep. 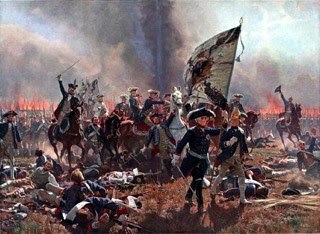 A bold attack by Austrian cuirassiers caused the regulars to form square, stopping the cuirassiers in their tracks. Steve's troops finally managed to shake off their inertia and renew their advance. Steve's grenadiers attacked and captured the Austrian battery which had been causing his command so much trouble. They withdrew taking the captured cannon with them. Steve's heavy battery finally got itself into position. Paul had garrisoned Oberwinden with a battalion of grenadiers. At some point during the game he pushed them forward to support his front line, but they were disordered then forced into square by a charge by French hussars. The grenadiers held on and the hussars were forced to withdraw. The grenadiers were then subjected to a hail of fire from the French and destroyed, leaving the way free for this battalion of volunteers to occupy the village and threaten the flank of the Austrian line. Even Paul acknowledged that leaving the town had been a mistake that cost him the flank. Conrad's troops have halted as there appears to be little reason to do more than pin the French where they are. Wurtemburg's command (Conrad) opposite Wangen. Steve launched yet another attack against the Austrian left forcing another battalion to break. In desperation Paul launched his hussars against the French, charging the French horse artillery in the centre. They survived closing fire and somehow some superb saves by Steve meant that the melee was drawn, forcing the hussars to bounce. Phew went Dumouriez! Another charge by the cuirassiers was also repulsed by a battalion of volunteers. The French surged forward and captured another battery of Austrian artillery. Paul's brigade holding the left was shattered and forced to retreat off the table. The still stationery Austrian right. Conrad had tried to order an all-out attack but had fluffed the command rolls. A final attack by the Austrians in the centre was ordered, and although it did actually get up close with the French it was in my view unlikely to have succeeded. It was a hard game to call at the end. In one sense the French were winners as they'd broken the Austrian left and captured Oberwinden and Neerwinden, however to what purpose as without a victory in the centre and left these gains were pointless as the Austrians were not defeated. Steve's troops were battered even if victorious, but most of the Austrian army was relatively unscathed. After much consideration I declared the game a draw if taken within the 'big picture'. The French army withdrew (in much better over than they had in the real battle) taking 16 Austrian battery pieces and a number of battalion guns and captured colours with them. The Austrians were unable and disinclined to pursue, again as in the real battle. A good game and played with the usual good humour, even in the face of unfortunate dice results, and gentlemanly conduct, despite the odd issue that still remains with BP2. I kept the changes experimented with to the move sequence and am now convinced that it is more logical to switch movement to come after firing, and it makes a better game. The 'masse' formation is something I picked up off another blog and adapted for BP. Essentially volunteers and the levee en masse can manoeuvre in attack column, skirmish order or in 'masse' which is essentially an open order column of mob. Slightly harder to hit but less effective when shooting or in melee. Once out of column they cannot go back into close order. As I make these units 'newly raised' and 'untested' it makes for an interesting game. If I played this again I might move Oberwinden and Neerwinden a little further north to make more space for manoeuvring around the flank. I had a little fun at the expense of both sides this time as I'd told the French that if the Austrians facing their left moved towards the river then French troops from the north might emerge on their flank. I allowed the Austrians to think their right flank secure and then let slip that it might not be one their troops moved towards the river. 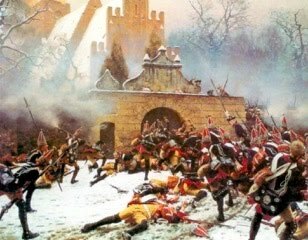 Of course there were no reinforcements coming astray were too busy fighting the Austrians to the north. As in the real battle, I suspect that after this result Dumouriez (The Traitor) and the Almost Headless Prince (Egalite-fils/Chalons) deserted to the Austrians. Miranda (The Universal Venezuelan) was arrested for allegedly (i.e. more than likely) being in cahoots with Dumouriez but was acquitted. He was retried, imprisoned and eventually released, when after involvement in at least two Royalist plots escaped to England in 1798. (Thanks to John for planting the idea for the title of this post in my head). I'm taking part in a refight of Fuentess d'Onoro hosted by the 'Like a Stone Wall' group which I am looking forward to greatly. Bonsoir, Jean le Rouge reporting on behalf of Miranda, who is apparently in his tent, blaming Dumouriez for not winning a complete victory. Well i can see why the French failed to win this first time round, a tough nut to crack. Our plan was to push hard on our left (naturally), with my forces sliding up to Nerwindeen to support. Then with luck rolling up the Kaiserlicks. The massed ranks of the ArchDuke Charles certainly discouraged anything too adventurous on our Right. 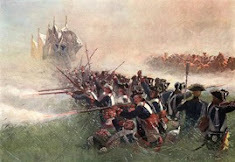 Our levy and volunteers did better then expected, despite coming under heavy fire and attack from horse, foot and guns. Buena Serra signor. Yes it was tough. Miranda did eventually try to overthrow the Spanish back home in Venezuela, got captured and died in a Spanish prison. A sad end for a fascinating if flawed character. Lovely looking game Colin! As ever, I’m really tired after working through all of the report! Cheers David. As lon* as it doesn’t actually send you to sleep! A very impressive game Colin but I am struggling to understand the advantages of changing the move and fire sections of the BP rules.Clearly it works but Im not certain how it improves the game. No doubt you will be at York and I hope to be there notwithstanding any further events so you can explain it then. Thanks Robbie. The benefits of the switch are best experienced by trying them out. Yes, hopefully see you at York. This is indeed a very tempting period. Thanks Aly. It is indeed a fascinating period, far better than Napoleonics imho, not that I wouldn’t ever rule out doing Napoleonics again one day.